In the late ‘70s and early ‘80s, Atlanta developed a reputation as a bad sports town. Thank goodness there wasn’t Facebook or Instagram back then because Atlanta-Fulton County Stadium was a meme just waiting to happen – from poor play on the field to empty seats off it – no one could match Atlanta for its athletic ineptitude. The 1990s ushered in a new era, turning the tide in the city’s favor. The Braves reeled off 14 straight division championships, we hosted Super Bowl XXVIII in 1994, the Olympics came to town in 1996, and the Falcons went to the big game in 1998. As this city has grown, we have seen the incredible impact that sports has on this community. I doubt that Atlanta has ever shined as bright as it did on Feb. 3, when Super Bowl LIII was played Downtown in Mercedes-Benz Stadium. The eyes of the world were on Atlanta, and we did not disappoint. At Jackson Spalding, we took special pride in watching the broadcast. 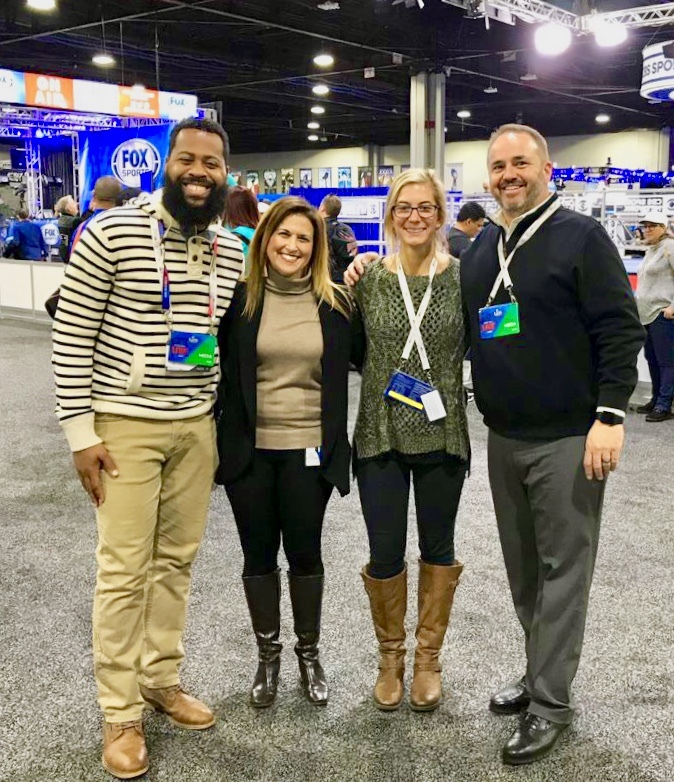 Our team spent Super Bowl week working alongside the Atlanta Super Bowl Host Committee, which is the 26-person team charged with putting on the event. The game was the culmination of more than three years of hard work for the Host Committee, and our team had the privilege of partnering with them every step of the way. While our agency has more than 160 team members spread from New York to California, Atlanta is first our home. When Bo Spalding and Glen Jackson opened our doors nearly 25 years ago, they wanted to make a profound imprint on the community. Whether it was serving area non-profits, leading civic organizations or partnering with local brands, Jackson Spalding has always worked to polish the jewel that is Atlanta. The Super Bowl was another chance to do just that. Sports have literally changed the Atlanta skyline in recent years. This city saw two of the country’s greatest sports venues, Mercedes-Benz Stadium and SunTrust Park, come out of the ground simultaneously while also witnessing an extensive renovation of State Farm Arena. These buildings are a testament to Atlanta’s robust economy and skilled workforce, which delivered facilities that will continue to lead to billions in economic impact for our city over the next few decades. Atlanta, as a host city, is on a winning streak that may never be seen again. The excitement began with the 2018 College Football Playoff National Championship, followed by the 2018 MLS All- Star Game, then Super Bowl LIII. It’s not over though, as Atlanta welcomes the 2020 U.S. Olympic Marathon Trials, the 2020 NCAA Men’s Basketball Final Four and the 2026 FIFA World Cup in coming years. No city has ever pulled off this level of sustained excellence. Add to it the annual events held here like the Peachtree Road Race (which is celebrating its 50th anniversary this year), TOUR Championship, Chick-Fil-A Kickoff Game, Chick-fil-A Peach Bowl, Air Force Reserve Celebration Bowl and Monster Energy NASCAR Cup Series race and you can make the case that Atlanta has no rival when it comes to hosting major events. As an agency, Jackson Spalding has had a front row seat for so many of these events. Having worked alongside franchises like the Braves and Falcons, as well as representing groups like the Atlanta Sports Council, the East Lake Foundation and the Atlanta Track Club, and major sports sponsors like Chick-fil-A, Delta and Coca-Cola, we have been witness to the transformative power sports has on this community. 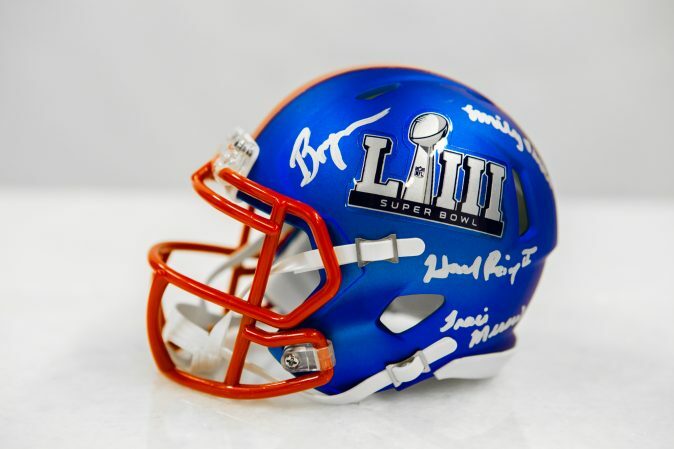 A commemorative helmet signed by our JS Super Bowl MVPs. One of the things we hold dear as an agency is our independence. Because we have remained locally owned and operated, we are able to invest time and resources into projects that make Atlanta a better place to live, work and play. That is especially true when it comes to sports. We like to say that we are not a sports agency – not that there’s anything wrong with that. In fact, there are some tremendous agencies here in our city that do nothing but sports. But we believe our “secret sauce” is in the fact that sports represent just a part of our overall client mix, and our team members who support sports clients also serve clients like Publix, Google, Orkin and Primrose Schools, among others. This allows us to bring insights from the corporate world into our sports practice … and vice versa. Our sports work makes us a better agency. It allows us to highlight our full suite of services, including media relations, event planning, crisis response, graphic design, videography, media buying and much more. A night at the ballpark or an afternoon at the golf course allows us to entertain our clients while showing them firsthand case studies of our work. Sports work gives us great visibility in the community and helps us attract and retain top talent. That’s a win-win. Super Bowl LIII put Atlanta center stage, and the city and its people gave an award-winning performance. At Jackson Spalding, we try to do that every day, whether it is on the field or in the boardroom. Last Sunday night, Atlanta was the big winner, and we were happy to be part of the championship team!